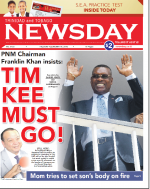 Published on September 5, 2016 in Culture, General T&T, PNM, Politics, Race and Identity, Racism Watch and UNC. 15 Comments Tags: African, BCM, Caroni, Selwyn R. Cudjoe, T&T Govt. In his article “Black Caucus, Black Humor,” Raymond Ramcharitar pours scorn on the BCM’s (Black Caucus Movement) demand for “land in Caroni for ‘Africans’ and saying it’s a love thing” (Guardian, August 17). He sought to reduce its position to “black humor” and to deride its claim for social justice it wishes to bring to the public’s attention. Published on August 2, 2016 in Africa, Culture and General T&T. 11 Comments Tags: African, Emancipation, Keith Rowley, Politics. Published on August 2, 2016 in Culture, General T&T, PNM and Politics. 5 Comments Tags: African, Emancipation, Politics, Selwyn R. Cudjoe, T&T Govt. Tomorrow (August 1st) is Emancipation Day. It’s a day on which the formerly enslaved commemorate their freedom; a practice they have undertaken since 1848 although there have been interruptions over the years. Generally, two different strata (those whose bread had been better buttered and those whose bread have been larded) have celebrated their emancipation in different ways.